The most prominent Bharuchi Vahora Patel in Manchester is 78 years old Ismail Kaduji of Nabipur. He was the first in our community to obtain a degree in pharmacy (B. Pharm). A drug inspector in India, he was sent to London in 1960 by the Indian Government to study forensic science. The following year he came to Manchester and was offered a job as a research chemist at Irlam Soap factory. During 1964-65, he found jobs for Vali Hafezi of Kothi-Vantarsa and Ali Aya of Valan and invited them from Bolton to Manchester. Saeed Patel of Nabipur and Yakub Sodawala of Palej came in 1966. Slowly, the number of Bharuchi Vahora Patels increased in Manchester. Today there are around 40 Bharuchi Vahora Patel families living in Manchester. Ismail Kaduji owned for some time a manufacturing plant that produced Dettol soap, cosmetics, toiletries and other beauty products. The first generation Bharuchi Vahora Patels worked in mills and factories. As they settled and progressed, they started their own businesses such as grocery shops, market stalls, newsagents, petrol stations, etc. Known as the King of Pound Stores, Dawood Fozdar of Dayadara and the Sodawala family of Palej own a series of pound shops, which sell all items for just £1 each. Manchester is well known for its Rusholme Curry Mile. 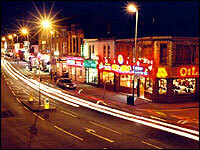 Here on the one mile stretch of Wilmslow Road, there are no less than 70 restaurants, take aways and kebab houses serving delicious Asian food. This place is always crowded, especially at weekends, by lovers of spicy Asian dishes. According to one estimate, 65,000 curry lovers frequent this curry mile, including university students and young people from the surrounding towns. Some Bharuchi Vahora Patels are also in this business and make a good living out of it. The young Bharuchi Vahora Patels born in the UK are well educated. There are architects, dentists, pharmacists, solicitors and IT engineers in the community. There is no masjid or madrasa exclusively managed by Bharuchi Vahora Patels. However, they are associated with their local masjids playing active roles. Hafiz (Suba) Ismail Malatagar of Tankaria is in the service of Cheetham Hill Masjid. There are no facilities or centres started by Bharuchi Vahora Patels for the youth or the elderly people of the community. There are no Bharuchi Vahora Patels actively involved in politics in Manchester and, therefore, there are no councillors representing the community like in other towns. This is a vacuum that need filling.